When one thinks fondly of American sports car racing in the the 1960s, one just has to come up with Jim Hall's remarkable Chaparrals. If nothing else, his cars were innovative. His 2A & 2C cars dominated the USRRC (US Road Racing Championship) in the mid 1960s and when the Can Am came into existence during 1966, the talk of the paddock was the Chaparrals. One of the problems with innovation is that sometimes it works perfectly for you and you dominate. At other times things just don't seem to go the way you want them. Chaparrals did not do particularly well in the Can Am as they had in the USRRC. The biggest problem was that they just didn't have the time to properly work out all the bugs and as everyone knows, what works in testing, doesn't always work on the track. There are other situations that arise where the builder has no control. The 2J was the first active ground-effects car. We all know about ground effects where one uses the rushing air to actually hold the car on the ground. Nowadays that is done passively with aerodynamics creating a low pressure area that is used to pull the car toward the track surface. When the 2J came along, it was unlike any other car on the track. Gone were the smooth lines, wings and spoilers. Instead, there was a boxy car with closed rear wheels and two huge enclosed fans on the back. On the side and back were clear Lexan shields that almost touched the track and were connected to the suspension to keep them in a specific place. What Jim Hall had done was to make an active ground effects car. Fans on the back were driven by a small (and very loud) two-stroke engine. In effect that acted like a vacuum cleaner to pull air up from under the car, thus providing the low pressure area needed. The Lexan shields were used to seal the underside as much as possible. The result was a car that could corner like no other on the track. The car also left a trail of dirt and junk behind it that was pulled up from the track. Problems with the fan motor, belts and Lexan shields prevented the car from doing well and it only actually completed one of the four races it entered during the 1970 series. What really killed the car was the sanctioning body. So great was the moaning and wailing from competitors, that active ground effects (and the Chaparral 2J) were banned. After that 2J, he gave up on sports cars and went on to Indy where he had a great deal of success. This kit is produced by ESDO of France and includes a plethora of bits and pieces in resin, cast and etched metal, and clear plastic. ESDO markets their kits as being for specific races. As anyone who is involved in car racing realizes, cars are often changed from one race to another as they are developed. In this case, the kit is offered for three races: Watkins Glen, where it first appeared, Laguna Seca, and Riverside. This is the Watkins Glen boxing. The body/chassis is in a pinkish resin and comes in four parts; a lower chassis and three upper body parts. These bits slot together nicely so construction won't be a problem. Any engine detailing that the builder wishes to add will disappear once the rear body section is put on so perhaps it is the limitation of the mold that prevented the upper body from being done in one piece. Other resin bits are the two intakes and a small splitter piece for the nose section. Tires are rubber, well molded and generic. Cast metal is used for the wheels, roll bar, steering wheel, mirrors, fan pulleys, axles, and some reinforcements. Etched brass is for the fans and rear spoilers. Brass rings are provided for the fan housings. Three sections or aluminum tubing are given for exhaust. Clear plastic is provided for the skirts a nd a forward air deflector. The resin will require some clean-up of the edges. Metal parts are fairly well molded but will need clean up and some parts (such as the steering wheel) suffer from mold mis-match. Instructions are basically drawings of the car. An exploded view is provided as well as a detailed shot of the rear of the car. There are specific drawings showing details of the three different boxings, so one picks the car in question when doing the model. Painting information is also provided. The car is basically white and bare aluminum. Not very fancy, but in Jim Hall's case, he was more interested in winning than having a fancy paint scheme. 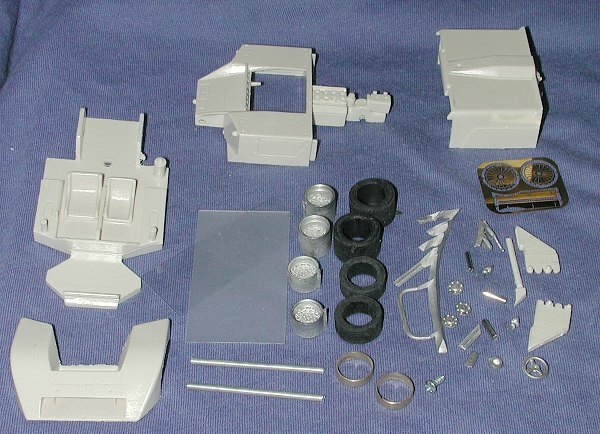 Templates are provided for the builder to cut the clear plastic as required. 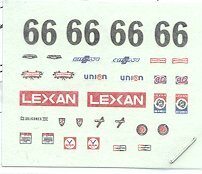 The small decal sheet provides all the markings needed for all three variations. While some may be put off by the price of this kit, it is quite reasonable and in line with others of its genre. I'm looking forward to giving this one a shot in the near future. Should be interesting.